February. Long winter nights can take their toll. Some of you may have been feeling lows of late, perhaps flu has come knocking on your door, or the winter blues. Taking time to listen to, and lift your spirits, is important and can take many shapes and forms. It can take the form of this raw cacao chocolate recipe! Yoga gives us time to retreat and listen to what our body and mind need. What else gives us happiness, a cuddle inside at this time of year? Yes, you’ve guessed it, Chocolate, or in this case Raw Cacao, Cocoa’s healthier relative, supercharged with magnesium and flavonoids. 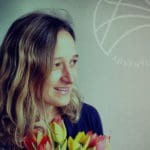 This delicious raw cacao chocolate recipe steers clear of refined carbs and sugars and sticks to those ingredients that love you back. 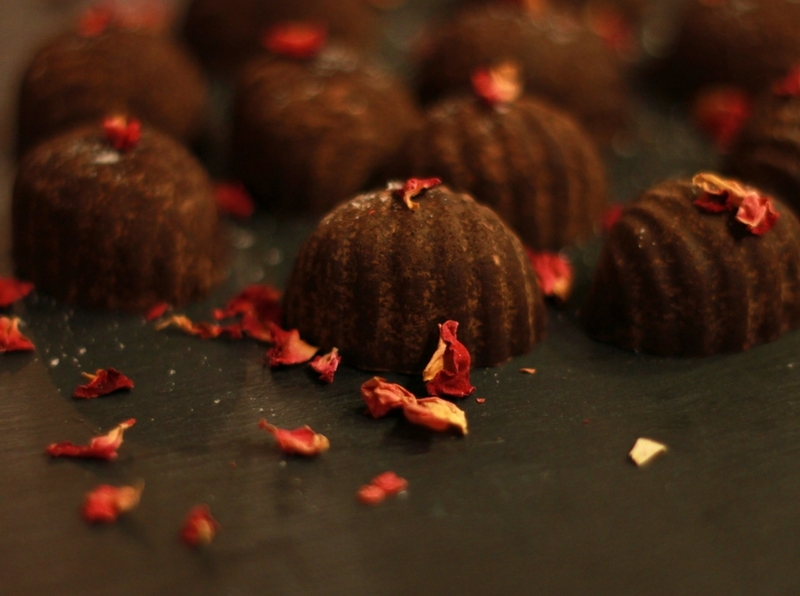 If you fancy sharing your chocolate love this February, try these amazing raw Chocolates. They are guaranteed to bring a smile to a loved one’s face. Or, if you are after an indulgent half an hour to yourself after battling with the elements, wrap yourself up with this warming and soothing Hot Chocolate on our other February love yourself special blogs. Flavour: the choice is yours. 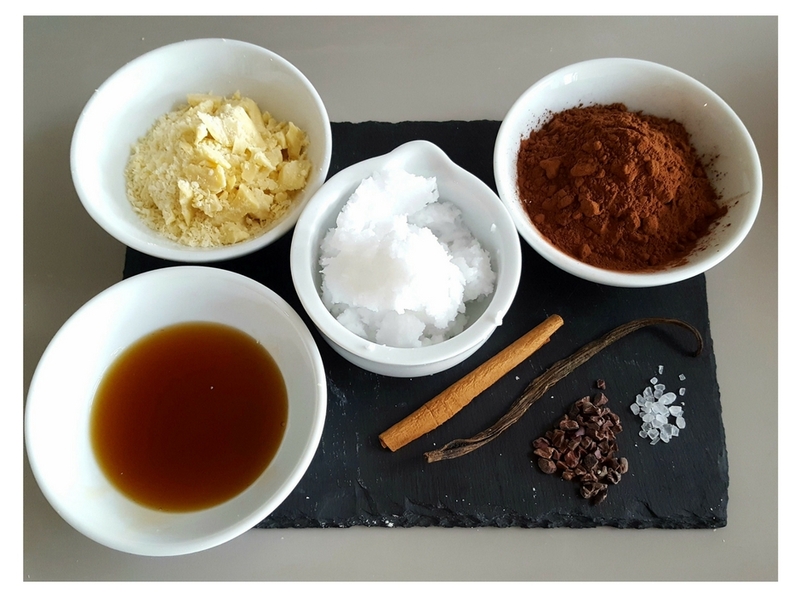 Vanilla, chilli, cacao nibs, chopped nuts or seeds, sea salt, dried fruit, cinamon, ginger…. 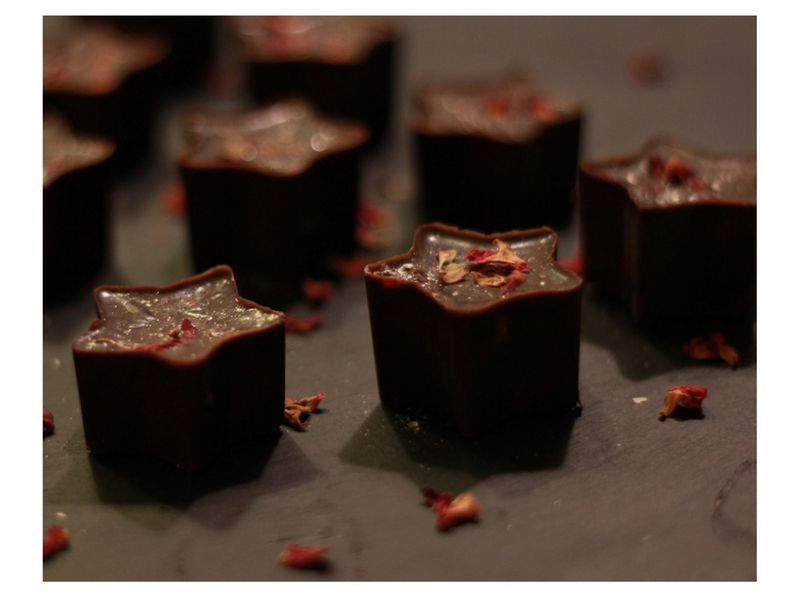 We used vanilla, cacao nibs, salt, blackcurrants and rose petals. Put a glass bowl over some water in a pan and bring to the boil, then turn the heat very low. Grate or shave your cacao butter and mix with coconut oil in the glass bowl and allow to melt, stirring gently. Take your time over a slow heat. Once melted, stir in the raw cacao powder and mix. Then add your sweetener and flavours. 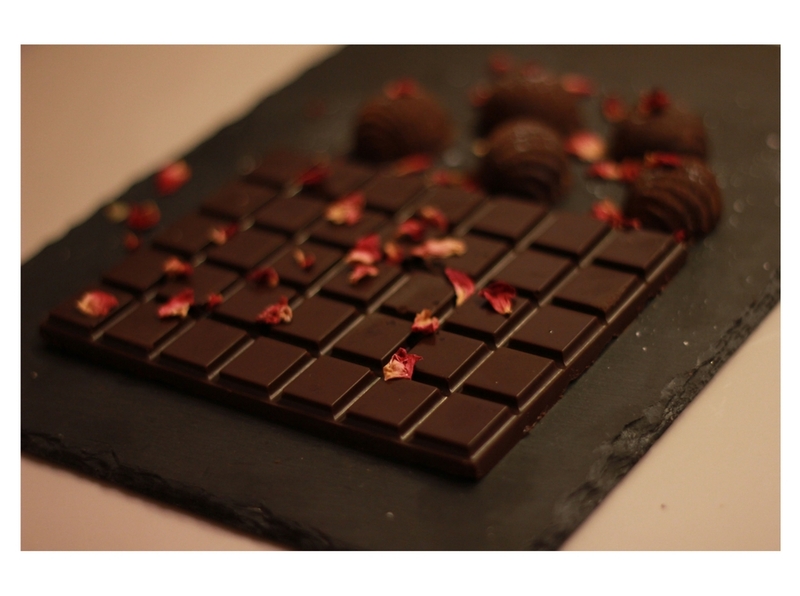 Pour into silicon moulds (or a shallow dish or parchment paper) and add additional extras such as dropping a blackcurrant into the middle of the mould and sprinkle rose petals on the top as we did. Put into the fridge for 20 minutes, try to not eat them all at once! Keep in the fridge for a week (if you can) or in the freezer. Raw cacao is made by cold-pressing un-roasted cocoa beans, which preserves the beans nutritional content. Cacao beans are rich in a number of essential minerals: magnesium, sulphur, calcium, iron, zinc, copper, potassium and manganese. Magnesium balances brain chemistry, builds strong bones and helps regulate heartbeat and blood pressure. High antioxidant levels support the cardiovascular and nervous system, by preventing free radicals from forming. Cacao has more antioxidant flavonoids than any food tested so far, including blueberries, red wine, and black and green teas. Cacao raises the level of serotonin in the brain; helping to reduce depression, PMS and promote a sense of well-being. Check out all our recipes in our recipe section on our blog – try our avocado chocolate mousse which is to die for! You can eat all of this amazingness on any of our retreats and holidays, so check out our calendar page for what we are up to this year! Or just email us if you have any recipe ideas that you would like to see on our blog! If you like to experiment then also try much loved DeliciouslyElla for inspiration.